So many countries, such a small a part of the world, so much to do there, so little time! Yup, if you’re anything like me, this is exactly how you’ll feel about your travels in Eastern Europe! For some reason it seems, we seem to try and cram more into our adventures here than anywhere else! Perhaps it’s because transport links and borders are easy or cities close together and countries easily crossed in a day. But whatever the reason, there’s little doubt you’ll be planning to jampack your Eastern Europe itinerary just like I did. And if that’s the case, then look no further than this perfect highlight list – 21 amazingly cheap things to do in Eastern Europe. First up on my list the 21 most amazing and cheap things to do in Eastern Europe, is to head to Kyevo-Pecherska Lavra in Ukraine’s capital Kiev. The holiest site for Orthodox Christians in the Slavic countries of Russia, Belarus and Ukraine, any visit here will be accompanied by hundreds of pilgrims, who seem to outnumber the tourists. This gives an amazing feel to the whole place, which is spectacular enough anyway with its gold domed roofs, hilltop setting and river views. I’d suggest visiting this spot at sunset when the crowds are much thinner, you can then experience the evening mass and the golden light of the fading day illuminating the monastery like something out of a fairytale. And best of all, it’s free to enter! There’s no question that first on your Prague itinerary needs to be exploring this glorious city’s famous Old Town. Start in the Square and take in the amazing Astronomical Clock as it chimes very hour. Then stare at the facades of the amazing St Nicholas and Týn Church, before strolling the cobbled backstreets and side alleys here, getting lost in maze of history and snapping to your heart’s content! All this is free and won’t cost you a penny! Afterwards, the historic St Wenceslas Statue is also worth a stroll to see. Walking the Walls of Dubrovnik in Croatia is basically a rite of passage in this country. While Dubrovnik isn’t cheap to visit, there’s definitely ways to see it on a budget – check out my post about exactly this here – and limiting what you spend money on here is definitely one way to do it. That said, one thing you should definitely splurge on an are walking the walls of this Old City. My top tip is to avoid going in the day time – the walls are literally packing with cruise tourists, but if you hit the walls after 5:30pm and walk them at sunset, not only do you get amazing views and colours, but there’s literally half the number of people there too! It’s also worth pointing out that with your walls ticket, you then get free entry to Fort Lovrijenac. As it’s free why not head over here to make your budget in Dubrovnik go even further! Just enter your details below and I’ll email it you – simple! With the beautiful Tatra Mountains within its border, Slovakia is the perfect place to go hiking in Eastern Europe – and amazing way to get out into the countryside and see a different ide of this wonderful part of the globe. With great peaks that soar up to 2500m above sea level and views to die for, there’s no question that strapping on walking shoes and heading out to hike in Slovakia is one of the best things to do in Eastern Europe on a budget. This was by far my favourite part of this Polish city – a historic area that now has a vibrant and poignant sense of regeneration around it and is a must see on your Krakow itinerary. From the eerily quiet synagogues, which still stand as testimony to the tragedy of the Jewish community that used to live here, through to youthful cafes, bars and vintage shops this is a great part of Krakow to explore via your own 2 feet making it esily of the most best things to do in Eastern Europe on a budget. Don’t miss the Old Synagogue in Kazimierz or the area around Szeroka street either, both of which are particularly nice. The town of Veliko Tarnovo is one of Bulgaria’s prettiest places set, as it is, on the side of a sharp valley and crowned by an impressive fortress. A wonderfully historic town, wandering the old streets here, window shopping in the old boutiques, stopping for a coffee and soaking in the mega chilled vibes is delightful enough, but the insane views offered across the town really up the anti! See if you can find the hidden walkway that hangs slightly over the edge of the town for the best views of them all – it’s def one of my fav in the whole of Eastern Europe! Another of the absolute must do things in Eastern Europe if you’re on a budget is stay in a floating hostel. Yes, just along the river, and with Kalemegdan clearly insight, is an incredible barge hostel, that is certainly one of the most unique and fun places I’ve stayed in any city ever! Arkabarka Hostel is a gorgeous backpackers that boasts beautiful private and dorm rooms, all with unique hand-painted walls, days beds and delightful views. It’s quiet setting makes it super peaceful and its communal area, where free breakfast is served, gives the most delightful river views. Sun yourself or catch a breeze from the wooden deck in summer or snuggle up in the free sauna during winter, either way the top location, free bike hire and excellent wifi in this hostel make it a top pick for your visit to Belgrade. #1 Good Camera – You will be pretty much snapping non-stop during your time in Eastern Europe and will need a good camera to do this gorgeous part of the world justice. I highly recommend the Sony A6000, which I use for all my travels and which I love not least because its light, compact and robust! #2 Good Walking Shoes – There will be a lot of walking in Eastern Europe, it’s as simple as that! Make sure your feet are comfortable therefore with a pair of New Balance Trainers. Perfect for stylish city strolling as much as for mountain hiking, I love mine! #3 Good Guidebook – I’m still a massive fan of the Lonely Planet Guidebooks and do think their latest Eastern Europe edition is well put together and able to save you a lot of money if you want to learn about the countries here, but not pay for a guide! I couldn’t have lived without my eBook version. #4 Good Water Bottle – All that sightseeing is thirsty work, so make sure you have a metal water bottle that you can refill as you go, because most tap water in Eastern Europe is drinkable… and free! Prepared to be bowled away by the splendour and grandeur of St Petersburg -­ from its architecture to its museums, galleries and stately palaces. I know many people who didn’t expect to love this city just as much as they did, so get ready to be amazed by the jewel in Russia’s tourist crown and to schedule in way more time here than you initially plan to! And now it’s time to head off the beaten track to Ostrava in the Czech Republic. This undersold city is incredibly up and coming with a pumping cultural scene, youthful vibrancy, great café culture and authentic feeling. There’s also large (and growing) amount of festivals that take place here. From music festivals, film festivals, dance festivals and street theatre festivals, there’s always something going on in Ostrava. And because this place isn’t yet visited by hordes of tourists, it’s an amazingly cheap city to visit too! Honestly there’s few greater pleasures and fewer better things to a small amount of money on than a train ride in Romania – especially if it’s through, across or into Transylvania. Trains in this country are insanely cheap – if you see the state of many of them you’ll realise why! – and this makes hopping on board one and spending hours staring at the stunning scenery whizzing past, absolutely one of the best things to do in Eastern Europe for those of us on a budget! Top rides include the 2.5-4.5 hr journey (depending which train you get) from Bucharest to Brasov and the 2 hour train from Brasov to Sighisoara. Entertainment and stunning views for a fraction of what it should cost! Over in the west of Ukraine, is the charming city of Lviv – the coffee capital of this country. Actually believed to be the birthplace of the roasting and brewing of the stuff in the Austro-Hungarian Empire, much like Vienna, Lviv is filled with coffeehouses and frequenting at least a few of them is a must in this city and Eastern Europe in general. You can see also see a statue of the guy who introduced coffee to the Austro-Hungarians care of his connections with the Ottomans in Lviv, as well as visit an underground cellar to “mine coffee” in this city. Yes apparently when this coffee house was built, a wall in the cellar was knocked through and tons and tons of coffee beans poured up. Now you can visit this cellar, which sits just off the Main square and even have a flambé cappuccino(!) then watch the roasting and grinding processes upstairs, as well as the buy the stuff too of course! Def one of the best amazing and cheap things to do in Eastern Europe on a budget, that prove just how quirky Lviv is! Montenegro really is a star in the Eastern Europe travel sky and one of my favourite things I did here was cycle round the Bay of Kotor. It actually is much shorter than it looks and easily doable in a day – including swimming, sunbathing, coffee, lunch and ice cream stops along the way! Heading out of the city of Kotor in a clockwise direction is the easiest way round to make the loop when it comes to ascents, and don’t forget you can hop across the small channel on the ferry with your bike too. Bikes can easily be rented just outside the East Gate of the Old Town – 10 euros for 24hrs – cheap and dreamy! And then you’re off cycling to your heart’s content! It’s probably one of the quirkiest things I got up to in Eastern Europe and it sounds like a bit of a strange attraction, but visiting the old Bobsleigh Track situated in some parkland in the hills above Sarajevo is definitely one of the most amazing things to do in Eastern Europe if you’re travelling on a shoestring. If you’re on a super tight budget, the multi-hour hike up here is the way to go (just set out early in summer before it gets too hot). Otherwise, if you can stretch to a few dollars, the cable car ride from the streets of Sarajevo up the hill provides insanely gorgeous panoramic views and is a lot of fun. Once at the top, you can walk the now empty and overgrown Bobsleigh track. Originally built for the 1984 Winter Olympics which took place in Sarajevo – it’s a stark reminder of how this city was before the pot-Yugoslavia conflict. An important archaeological site and the finest set of ruins in this country, strolling around here still costs a fraction of what it should do and is absolutely one of the best budget things to do in Eastern Europe if you’re interested in history. One of the most amazing experiences I had in Eastern Europe, was the WHOLE day I spent at Szechenyi Baths in Budapest. The most popular and largest Baths in Budapest (and there’s a few to choose from FYI) allow yourself plenty of time here to swim and relax in the various heated pools, as well as enjoy the saunas, steam rooms and thermal waters here. Basic entry to Szechenyi Baths is 18 euros – however it’s well worth it for unlimited day access. You can book your visit to the Baths online in advance, or just turn up and pay on arrival. If you’re doing not booking ahead then I suggest getting here early in the morning to ensure you get a sunbed space and locker or make it an evening thing and enjoy lounging in the thermal waters as the sun goes down and the crowds dissipate. Open from 06:00 until 22:00, this is one part of your Budapest itinerary that can’t be missed! There’s no doubt visiting Auschwitz is a unnerving, emotional and intense experience. I’m not going to go too much into how you will / might / should feel or what I felt visiting there either. I’m simply going to say I think it is important to go and witness the horrors of the past to ensure the stories are not forgotten. And when it comes to coverage for your adventures in Eastern Europe, look no further than travel insurance from World Nomads, who I used during my travels in this part of the world and beyond. With its picturesque lake, popular beaches, gorgeous Old Town, Medieval castle and restored churches, Macedonia’s Ohrid is the perfect place to put your bag down for a couple of days and relax. There’s tons of activities from walking to fishing that you can enjoy round town, but with its gorgeous setting and chilled vibe, this is also the ideal spot to relax in Eastern Europe – you are on holiday after all! A visit to the charming Transylvanian town of Sighisoara is absolutely one of the things in Eastern Europe you can’t miss when backpacking here, not least because it’s cobbled street Medieval charm feels like something out of a storybook! Climb up the hill to get to the historic centre, dump your bags at the brilliantly located Burg Hostel and spend an afternoon strolling the streets here and snapping to your heart’s content. With gorgeous views across the New Town below, the river and the rolling hillsides around, you also can’t miss wandering up to the Citadel (free) and climbing the steps to the top of the Clock Tower to grab perhaps the best view in Transylvania there is. When it comes to amazing things to do in Eastern Europe on the cheap, I can’t not mention one of the most amazing sunsets I have seen…EVER! Plovdiv in Bulgaria offers an amazing lookout point care of the top of this ancient city – an amazing open space, scattered with a few Roman ruins (you know how it is) and the perfect promontory from which to watch the sun go down over this town and the stunning surrounding countryside. A beauty in itself, I’ve got to say that day tripping out of Mostar was perhaps even more enjoyable than the city itself. One heck of an epic adventure, you simply can’t miss Moran’s Tour, which is a wonderfully personal, eye opening, fact-filled, fun and gorgeous day around the landscape of Hercegovina. In fact, I’m even going to say it was my favourite day trip during my whole travels in Eastern Europe – quite the accolade I know! We visited the towns of Blagaj, Pocitelj and Kravice Waterfalls as well as an amazing hidden bunker and surrounding countryside and there’s no question this is one of top reasons why I enjoyed Mostar so much. Just go to Hostel Miran in the city to book. Having just recently opened its doors more freely to tourists – via a new, free visa on airport arrival – one of the most amazing and cheap things to do in Eastern Europe right now is go to Minsk, the capital of Belarus. The last undiscovered frontier of this part of the world, a Soviet time capsule, Minsk is as surprising as it is quirky and exciting. This def makes it top of my bucket list! 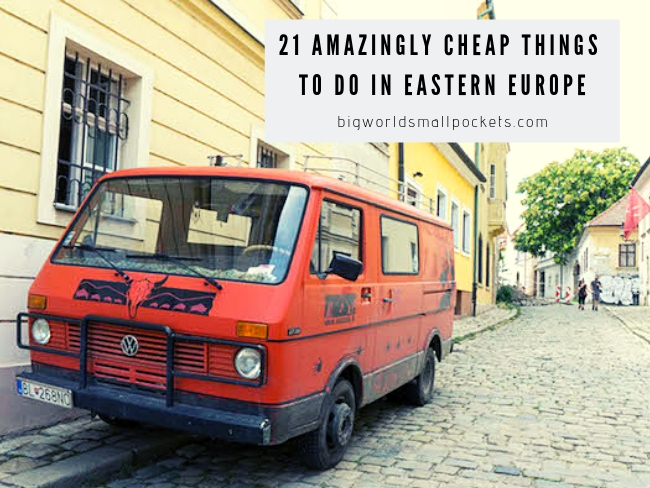 And there you have it, my highlight list of the 21 amazingly cheap things to do in Eastern Europe – it’s sure to keep you going for a while! Don’t forget to reach out and let me know when you’re planning to travel Eastern Europe and if you’ve got any burning questions about doing this on a shoestring. The post 21 Amazingly Cheap Things to Do in Eastern Europe appeared first on Big World Small Pockets.